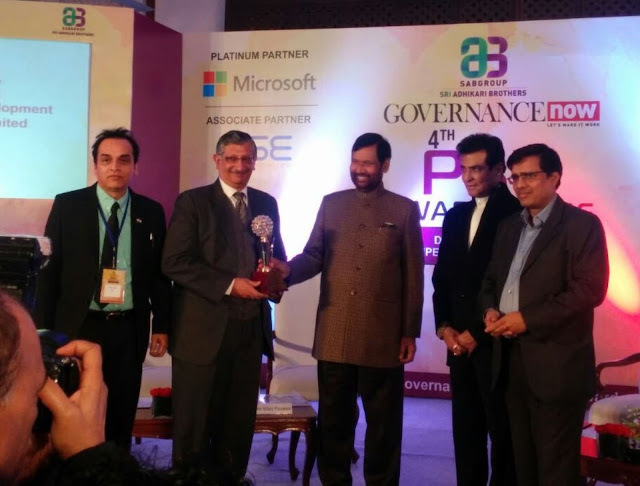 New Delhi: 28th December, 2016- India Tourism Development Corporation (ITDC) has been bestowed with “Best PSU award for CSR Initiative” in Miniratna Non Financial Category at the 4th Edition of Governance Now PSU Awards 2016. The award was presented to ITDC at a star studded award ceremony in New Delhi, where Shri. Umang Narula, Chairman & Managing Director, ITDC and Shri. Piyush Tiwari, Director Commercial & Marketing, ITDC received the esteemed award from Sh. Ram Vilas Paswan, Union Minister of Food and Public Distribution and renowned actor Jeetendra. ITDC has adopted Qutub Minar as a part of its CSR initiative under the aegis of Government of India’s Swacch Bharat Abhiyan and organizes regular cleanliness drives at the monument’s premises. It has provided a dedicated workforce to supplement the staff of ASI involved in maintaining cleanliness of the monument. ITDC was incorporated in 1966 with a mandate to develop and expand tourism infrastructure in the country. The Corporation has been moving ahead with consistent efforts on development, growth and world class services and amenities to its guests. Apart from running Hotels the ITDC has diversified into non hotel sectors like Ticketing, Tours and Travels, Event Management ,Duty Free Shopping, Publicity & printing consultancy, Engineering Consultancy ,mounting Sound & Light Shows, Hospitality education and skill development– all under one roof.